The card reveals for Hearthstone's Kobolds & Catacombs expansion are underway, so Shacknews takes a look at more card reveals from the past week. 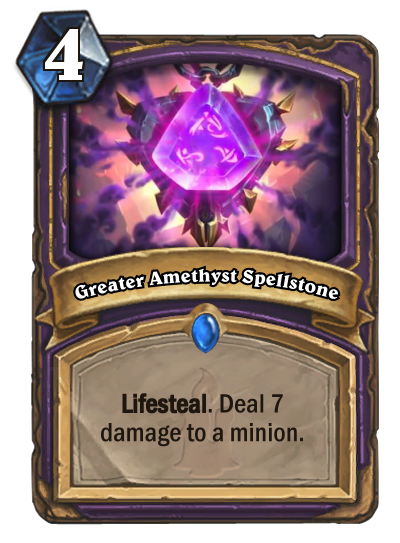 Analysis: This is a brilliant spell for Warlock players, simply because they already have several existing cards that'll deal self-damage, like Hellfire and Abyssal Enforcer. That isn't even touching on the cards the Warlock is about to get, which we'll touch on in just a second. So assuming this spell is upgraded, it becomes the Warlock's most potent single-target damage card, one fully capable of taking out a high-value opposition target. And it's one that also heals for a whole lot. That means it'll keep Warlock players are relatively high health and play nice with certain other minions, like Happy Ghoul. There's a lot to like about this spell and it should become every Warlock's best friend going forward. Battlecry: Draw a card. Deal 2 damage to your hero. 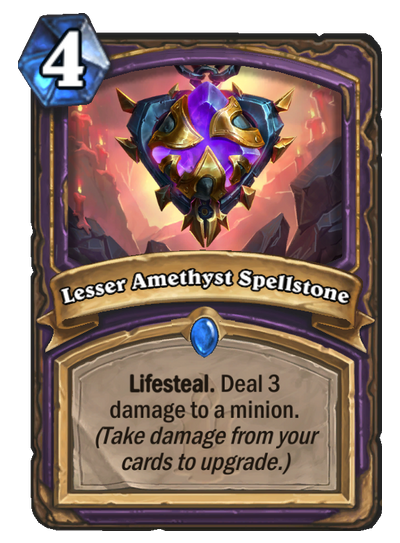 Analysis: So what are some newer ways to power up that Amethyst Spellstone? How about this beauty of a card that will most assuredly become the Warlock's new favorite opening turn play? 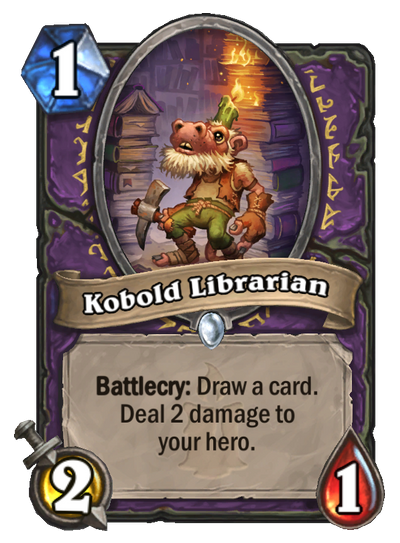 There is absolutely nothing to dislike about Kobold Librarian. It is exceptionally rare to find an opening turn play that draws a card. It deals less self-damage than Flame Imp, but when one looks at this as a first turn Life Tap, the value starts to become clear. Warlock succcess is at its highest when those players are able to rummage through their deck early and being able to do so on the first turn is tremendous. An absolute A+ card for Warlock. Taunt. Battlecry: Deal 2 damage to your hero. Analysis: This is another solid card for Warlock, even if the self-damage is going to start piling up. Those 2/4 stats on such a cheap minion will look awfully appealing to Zoolock players, especially when boosted by Prince Keleseth. And given that Kobold Librarian is threatening to take the other Warlock 1-drops' lunch money, it'll be nice to have something standing in for Voidwalker. It's also a great defensive option early in the game against those pesky aggro players. 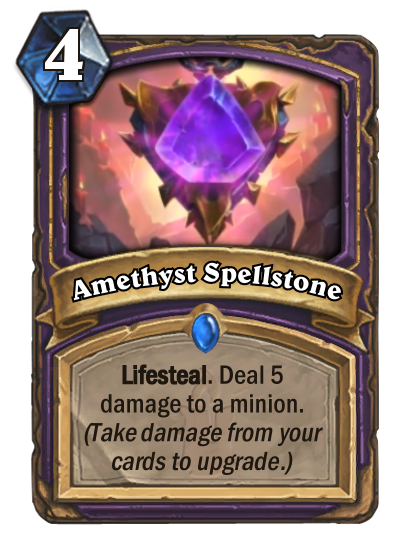 It's a great early-game option overall, though Warlock players may want to think about whether they do want to drop this on Turn 2 or keep right on hitting that Life Tap. It's ultimately up to personal preference whether to pack this in or keep Voidwalker around. Either way, be sure to pack Mistress of Mixtures, because the self-damage is going to start piling up, regardless. Analysis: It looks like Blizzard would very much like to encourage Warrior players to go back to that old Control Warrior style that made the class such a joy in the first place. There's been little incentive to play Control Warrior, partly because of aggro's effectiveness, but also partly because Control Warrior doesn't have a lot in the way of board presence. 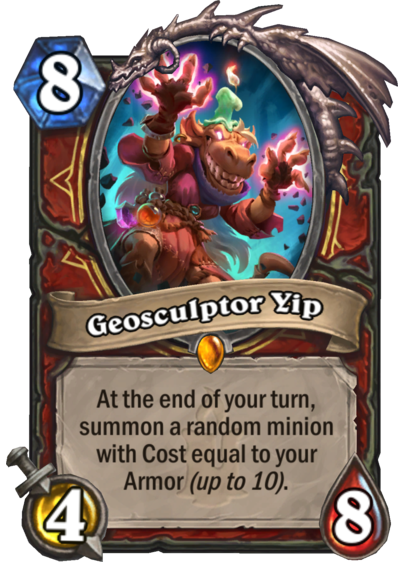 But here comes Geosculptor Yip to reward Control Warriors for all their hard work. Assuming the Control Warrior is able to build up enough Armor, Geosculptor Yip pays amazing dividends. It has the potential to leave a 4/8 body with a 12/12 Deathwing, which sounds pretty sweet. If keeping the Armor total up is an issue, Warrior players can even opt to roll the dice by playing Bring It On! before dropping the Legendary. It's a gamble that just might be worth the risk. Another dark horse for this minion: C'Thun Warrior. If the C'Thun Warrior can rack up the Armor total with Ancient Shieldbearer, Geosculptor Yip becomes a lot more dangerous. This has potential in Standard and even greater possibilities in Wild. Analysis: Blizzard is now starting to address a critical Hearthstone question that was certain to arise in the next few months: What happens when Evolve rotates out of Standard? The answer? The new Unstable Evolution card! 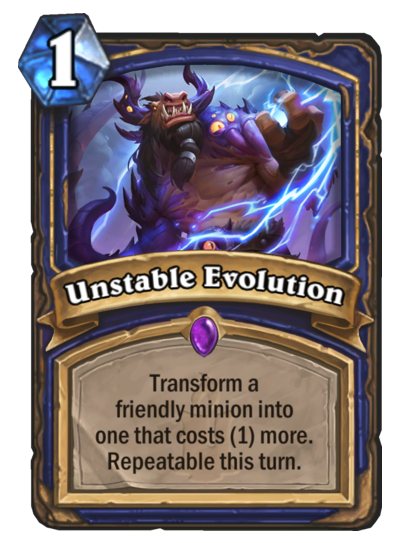 Unstable Evolution is a single-target Evolve spell, but one that can be used repeatedly on the turn where it is introduced. So now there are options to go along with Doppelgangster. Want to evolve all three guys to 6-mana minions for 8 mana? That's pretty expensive. How about Doppelgangster and Evolve to evolve all of them to 6-mana minions, but then use Unstable Evolution to keep evolving one of them until they're a 10-mana minion? Moves like this are entirely possible and it's even possible to take a 1-mana drop and keep evolving it into something dangerous. This obviously plays very well with Thrall, Deathseer and is the beginning of life after Evolve for the Evolve Shaman. Life does indeed find a way. Analysis: GADZOOKS! Somebody thought to take the Primordial Glyph effect, cross it with an Etherreal Peddler, and put it on a Chillwind Yeti! Oh, and it has Elemental synergy, because of course it does. So let's break this down. A Mage player that pulls a spell off of Primordial Glyph already has that spell discounted by 2, but this minion will discount it by another 2! Say hello to a 6-mana Pyroblast! (4 mana, if you play two Manipulators over the course of the game!) But that's not all! Read the text and it will say any card that didn't start in your deck. That means any card found off a Discover effect goes down by 2. That means any card pulled from Servant of Kalimos or Kabal Courier. How about any card off Ysera or The Lich King? And technically, this SHOULD work on the second and third incarnations of Pyros, since the 6/6 and 10/10 didn't start in the player's deck. The Mage has gotten some insane cards in this expansion so far, but this is going to take the cake. 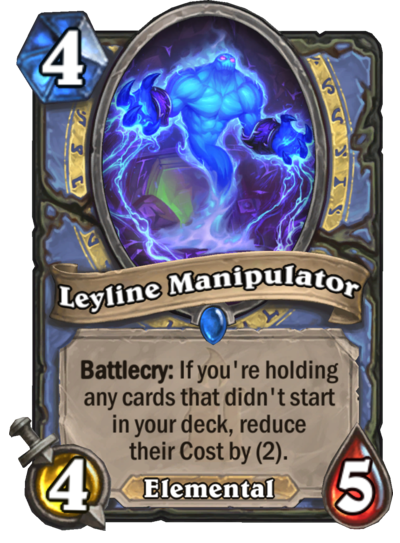 There's a real chance that Mage owns everyone's face in the new meta, especially with something like Leylin Manipulator. Secret: After your hero takes damage, become Immune this turn. Analysis: Look out! It's Diet Ice Block! Evasion is diet in the sense that, theoretically, if the first hit to the Rogue is lethal damage, it should still take. Otherwise, the Rogue is protected for that turn. It's also diet in the sense that the first hit will activate it, so it's not an emergency Secret in the way that Ice Block is. The Rogue needs to be smart about using this Secret. Use it too early and it'll likely be gone quickly. So that takes some of the effectiveness out slightly, but that doesn't mean this still isn't a pretty good card. Any card that grants facial immunity, even with limitations, is still nothing to sneeze at. 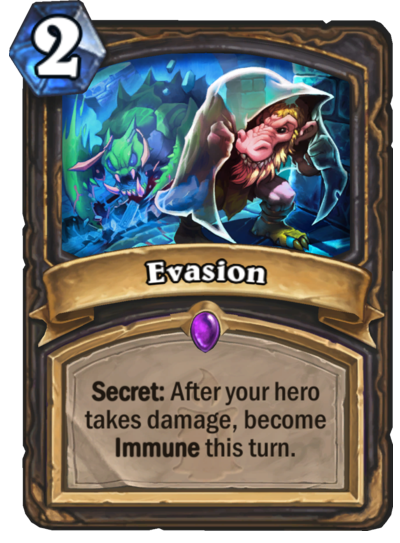 A smart Rogue player will be able to maximize this effectively, setting up enough resources to strike with lethal damage on the next turn. 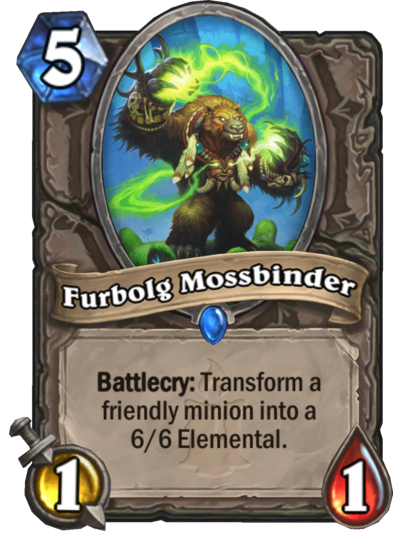 Analysis: Furbolg Mossblinder is a minion that's easy to dismiss at first sight, but it might not be as bad as it looks. At worst, it transforms a weaker minion into a 6/6, which is like a pseudo Turn 5 Big-Time Racketeer. That's not the worst thing in the world. Where it starts to get a little more useful is in taking negatives and making them into positives. Imagine you're on the receiving end of a Polymorph or Hex spell. Take that lemon and turn it into a 6/6 Elemental. Or take a friendly minion on the verge of death and turn it into a fresh 6/6. There are certainly uses for its effect and it helps that the effect is targeted, unlike something like Tinkmaster Overspark. So will this find its way into constructed decks? Well... maybe Evolve Shamans might want to give this a look. Turn something tiny into a 6/6 and then take that handy new Unstable Evolution spell and play around with that other 1/1 body, make it into something useful. Or better yet, use Thrall, Deathseer's Hero Power and use that to upgrade the 1/1 into a better 6-mana minion. Furbolg Mossblinder isn't going to be a top-tier card, but it isn't quite the garbage card that its stats might suggest. Gain 5 Armor. Gains a bonus effect in your hand. 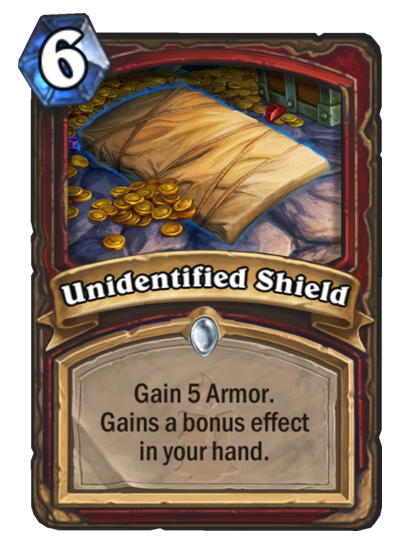 Analysis: With a 5 Armor gain, Unidentified Shield starts off as Shieldmaiden without the 5/5 body or a more expensive Shield Block without the card draw. That's not great. So those had better be some darn good bonus effects and... well... they're a gamble. Spiked Shield is the best outcome, since it's a 5 Armor boost with an Arcanite Reaper. Runed Shield basically makes this into a spell version of Shieldmaiden. And Tower Shield is a pretty nice Armor boost. The problem is, all of these bonus effects suit different situations for different deck types. And since they're all random, they might not suit the scenario at hand. I personally don't like the idea of gambling with these particular effects, so I'm going to rule this as a pass. Analysis: Given the hand that the Mage has been dealt so far, it was only a matter of time before a little RNG rain must fall. 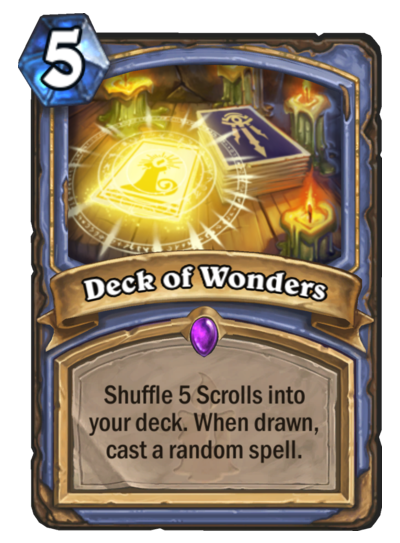 Deck of Wonders would be a decent card, except any of the random spells cast have a chance to backfire. That means, yes, there will be at least one case of somebody Pyroblasting themselves in the face. And that's not fun. So is anybody going to keep this spell in their deck? That's unlikely. Unfortunately, that doesn't mean it won't pop up in cards like Cabalist's Tome. So it probably will show up at some point and there will be pain. But hey, at least the blooper videos on YouTube should be entertaining. The card reveals are underway, so keep visiting Shacknews for more card analyses. We're also be breaking down the Legendary weapons individually in the next week. Hearthstone's Kobolds & Catacombs expansion is set to release on December 7.